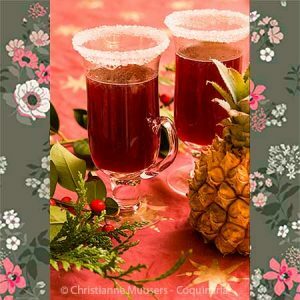 Sangria, punch and bishop wine all are descendants of spiced wines that have been drunk since Antiquity. They were especially populair in the Middle Ages, when they were served at the end of a meal as digestive. 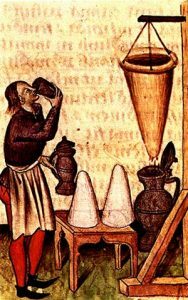 These wines, with added spices and sweetened with sugar (which was also considered a spice), were called hippocras. The name does not derive from the ancient Greek physician Hippocrates, but from an invention by him: the sleeve of Hippocrates. This sleeve consisted of several filter bags hanging on top of each other, through which the liquid would seep down. Hippocras is best served cold. The original text of the recipe for hippocras (or hypocras) is missing in this edition. That is because this recipe, a fifteenth century addition, appears only in one of the three manuscripts of the Ménagier that have survived (all three manuscripts date from the fifteenth century, there is no autograph by the Menagier himself). The additions are partly published by J. Pichon in an appendix to his edition in 1847, vol. 2, p.273 (see bibliography). Pour faire ung lot de bon ypocras. Prenes une onches de cinamonde nommée longue canelle en pippe, avec unes cloche de gingembre et autant de garingal, bien estampé ensemble, et puis prenez ung livre de bon çuquere: et tout cela broyés ensamble et destrempés avec ung lot du milleur vin de Beaune que pourrés finer et le laissir tremper ungne heure ou deux. Et pus coullés parmy ung chause par plusieurs fois tant qui soit bien cler. To make a lot (=liquid measure) fine hippocras. Take one ounce cinnamon called long cinnamon in sticks, with some pieces of ginger and as much galanga, grind well together. Have a pound of fine sugar, and grind together and mix with a lot of the best wine of Beaune you can get and let this stand for one or two hours. Then let it run through a sack several times until it is clear. The recipe explicitly mentions wine from Beaune, a Bourgundy wine. It is not necessary to use a grand cru, but please use a fairly good wine, as the hippocras will never be better than the wine it is made of. Cheap wine, bad hypocras. For one bottle of wine; preparation in advance 5 minutes; preparation 2 hours + 15 minutes to filtre + some days to rest. If you want to use the spices afterwards to make mustard, pack the ground spices in a coffee filter, and close this tightly. If you want to use the spices for mustard, just scoop out the dregs (that is what has become of the spices after two hours soaking in wine) afterwards. If you just want to make hippocras, you can also mix the spices directly in the wine. It will be more work to get a clear wine, you will have to strain the wine several times. However, if the wine remains a little opaque, this will not affect the taste of the hippocras. Mix wine with sugar, and add the spices. Let stand for two hours. Strain the wine through a moistened cheese cloth and rebottle the wine. Keep the hippocras in the refrigerator, and wait a couple of days before serving. The spices that were used for the hippocras can afterwards be used to prepare mustard, according to the Ménagier. In summer this wine is delicious when slightly chilled, in winter you can heat the hippocras before serving. But remember: the alcohol evaporates when heated. 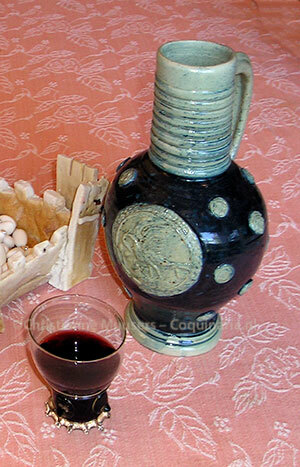 In medieval times this spiced wine was served as a digestive (after dinner drink), with some sweets to nibble. 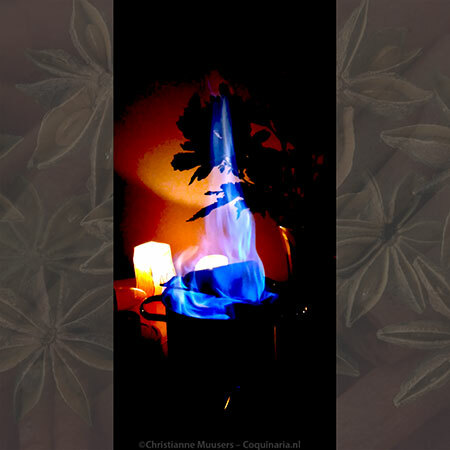 A recipe for spiced wine with honey from the sixteenth century can be found here. G.E Brereton and J.M. Ferrier, Le Menagier De Paris: A Critical Edition (Oxford, 1981). The edition Le Mesnagier de Paris has the Oldfrench text, but not the notes, of Brereton and Ferrier, with a translation in modern French by Karin Ueltschi (Paris, 1994). Jérôme Pichon, Le Ménagier de Paris, Traité de morale et d’économie domestique […] (Genève, 1847, 2 vols). Complete online facsimilé version of this edition: Volume 1, Volume 2. Printed reproductions van Volume 1 and Volume 2 are available since spring 2010. Online version of the transcription of the culinary part of this edition. Online English translation of the culinary part based on this edition by Janet Hinson.